After 70+ years of joyful working with wood, I thought I had seen most everything, but several weeks ago, something new happened. I had just moved my entire shop to a new location. The move took over a month, and when I arranged everything again, I naturally was very excited to be back into making sawdust. 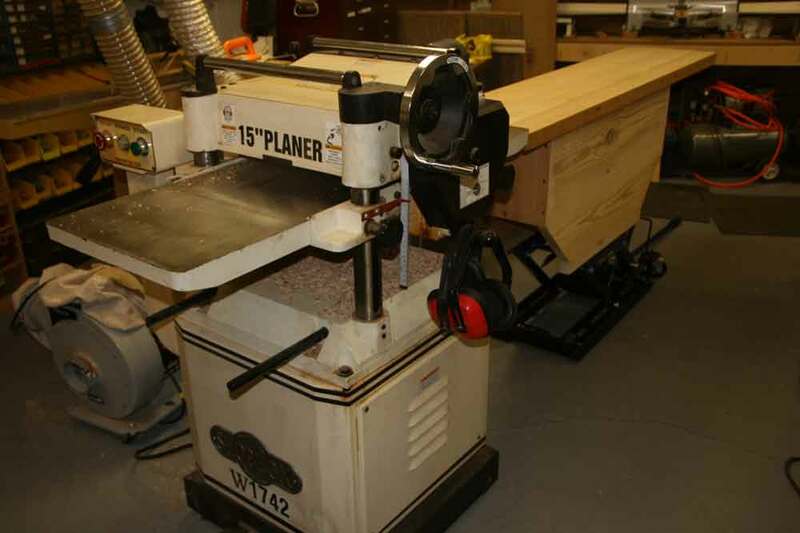 During the move, I had placed a big metal chest with a nice maple top on the outfeed side of my 15 inch planer. It was just the right height to catch boards coming out of the planer, about 1/2 inch lower than the planer outfeed table. As a test, I selected several rough sawn ¾ inch boards and planed them. What a good feeling it was to see them feed perfectly onto my new outfeed table arrangement. No more scrambling to catch the long boards. 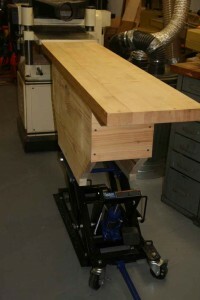 The next day I needed an eight foot long by one and one half inch thick piece of pine, so I ran a slightly thicker piece through the planer, a piece I had saved from another project. I watched with pride as the chips flew. But suddenly the planer started rolling backward on its roller base toward the open back door to my outside loading dock. Panic immediately set in. I was on the wrong side of the planer to reach the shut off button, and the machine was heading outside. Fortunately, as it headed for the door, the power cord was pulled to its full length, and the power plug separated from the wall outlet. Too late. I realized that when I cranked down the planer table to the new thickness setting, the thicker wood being pushed off the planer was lower and would catch the edge of my new off feed table, which weighed about 100 pounds. It wasn’t about to move, and the planer is on a rolling base. After telling the story a half dozen times, I decided it was time to solve the problem. I noticed a used motorcycle lift on Craig’s List, and drove over to see it. It just might give me a start on building an adjustable off feed table that would avoid my problem. The motorcycle lift platform stayed level as it went up and down, so it was a perfect base for the new adjustable off feed table I needed. A piece of 2×10 pine, a couple of 2×4’s and a five foot long used maple butcher block section from my lumber stash were all I needed to built an adjustable base to raise and lower the off feed table height to match the various wood thicknesses I need to plane. A valve on the lift controls lowering, and a foot pedal nicely pumps the table up when needed. The table top is hinged and swings up from the back, providing nice storage space. A new vertically adjustable work table costs from $400 to $1000. Mine cost under a hundred dollars. 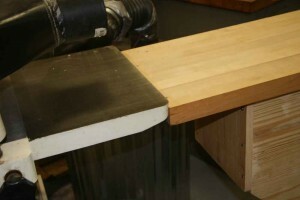 Not much money to prevent a planer from escaping from the shop.